I learned how to make crêpes when I was around 10. My Zia Carmela in Italy taught me, and she was sure to tell me how they can be used in a variety of recipes. They are inexpensive to make, require few ingredients, and can be savory or sweet. 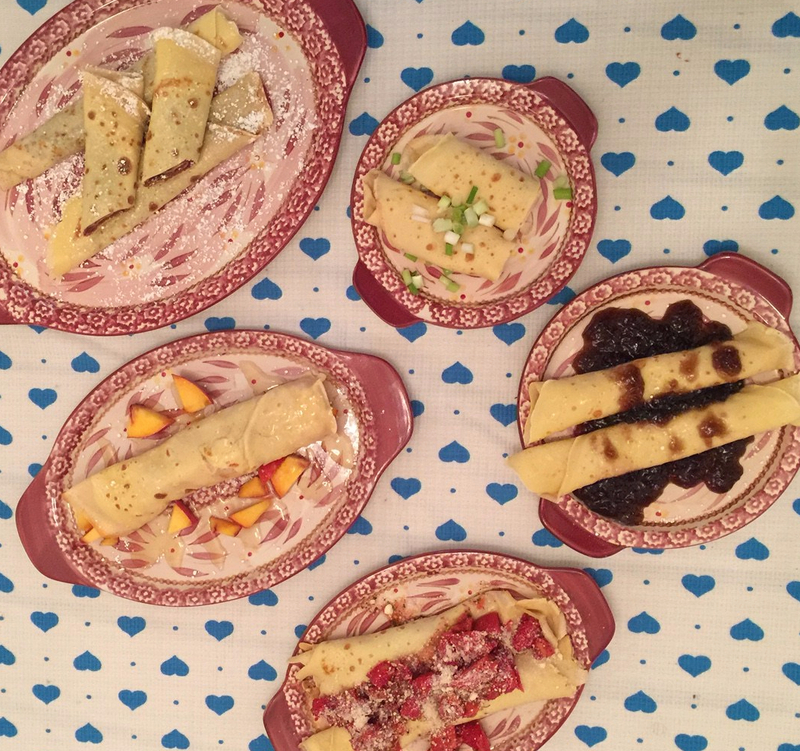 From my favorite, Nutella, to jams, jellies, and cheeses, crêpes are a delicious blank canvas for your edible imagination to paint with colorful flavors! Traditional crêpes use butter and sugar. I leave those out of my recipe – for sense and simplicity and to avoid those extra calories. Mix ingredients together and beat until no lumps. Once the batter is smooth, allow to sit about 5 minutes (if you can wait). Heat a non-stick pan over medium-high heat. Spray with cooking spray (again, I don’t use butter here either). Laddle a thin amount of batter and move the pan around to spread thinner. When bubbles form and underside is golden browned (you’ll see little spots – about 2 to 3 minutes), flip and cook an additional minute or two. Now, the super fun part – filling them with whatever your imagination allows. For tonight’s selection, I made the below easy fillings to satiate everyone’s favorite flavors! A traditional favorite, Nutella spread is a decadent late night dessert or early morning breakfast! Mix 4 oz. room temp cream cheese with 1 tbsp. peanut butter & 1 tbsp. powdered sugar. Top with your favorite jelly (here I used grape!). Chop fresh peaches (or any fruit of choice). Fill the crêpe and drizzle with honey. Mix 4 oz. of room temp cream cheese with 2 tbsp. pesto. In a separate bowl, dice two fresh tomatoes and mix with 2 tbsp. each of oregano and extra virgin olive oil. Add 1/2 tsp. salt. Mix and use as topping over the crêpes. Sprinkle with grated parmesan cheese. This one is super easy. Just buy some Philadelphia Cream Cheese Smoked Salmon flavor, spread on your crêpe and sprinkle with fresh sliced green onion. This one is my favorite! Whatever your choice, you can prepare an assortment of choices or have your guests make their own by preparing a topping bar!